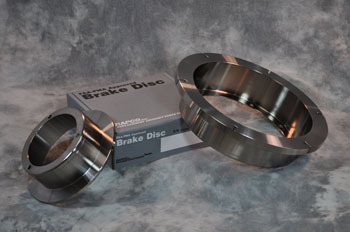 RAPCO offers FAA-PMA approved direct replacement brake discs for Cleveland and McCauley brake assemblies. They are designed and tested to meet or exceed OEM performance and provide outstanding service life. RAPCO brake discs are forged from carbon steel billets which have a tightly aligned grain structure for superior strength. In addition, the discs are heat treated for a long service life. This is not only important for the discs, but it also helps to maximize brake lining life as well. 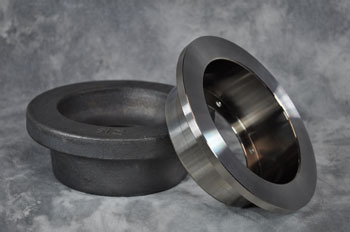 The hardened forgings are precision machined and then plated with electroless nickel for corrosion resistance. In a final machining process, the wear surfaces of the disc receive an additional turning to assure they are true. This reduces vibration and allows the disc to rapidly transfer heat away from the lining material, resulting in improved stopping and longer service life. Then each disc is laser etched for proper permanent identification. RAPCO brake discs offer premium features at a competitive price. Excessive brake pedal pressure, especially in aircraft equipped with a tail wheel, can cause the aircraft to lose control or overturn. In addition, taxiing with continued brake pedal pressure can result in loss of brake function, damage to the brake assemblies or even fire. The above conditions can possibly result in death, bodily injury, or property damage. When installing brake linings be sure to check the aircraft's maintenance manual for the proper torque value of back plate bolts. Over torquing can damage brake cylinders. After installing new brake linings or new brake discs the installer must confirm that the wheel assemblies rotate freely while properly jacked above the ground. If they do not turn freely the aircraft must not be returned to service until the problem has been resolved. Failure to do so can cause loss of aircraft control, reduced take off performance, or fire, possibly resulting in death, bodily injury, or property damage.